Thank you for your interest in one of Mcphail's Auto Sales's online offerings. Please continue for more information regarding this 2017 Honda Accord Hybrid Touring with 31,134mi. This Honda includes: BODY SIDE MOLDING (DIO) ALL SEASON PROTECTION PACKAGE II HYBRID (DIO) WIRELESS PHONE CHARGER (DIO) REQUIRES *Note - For third party subscriptions or services, please contact the dealer for more information. * When you purchase a vehicle with the CARFAX Buyback Guarantee, you're getting what you paid for. The less money you spend at the pump, the more money you'll have to spend on you. So why not consider this wonderfully styled, fuel-efficient Honda Accord Hybrid. The Accord Hybrid Touring is well maintained and has just 31,134mi. This low amount of miles makes this vehicle incomparable to the competition. Added comfort with contemporary style is the leather interior to heighten the quality and craftsmanship for the Honda Accord Hybrid With all records included, drive away confidently knowing the complete history of this Honda Accord Hybrid Touring. The interior of this Honda Accord Hybrid Touring has been through meticulous inspection and could almost pass for a brand new vehicle. Want a mobile theater? This Honda Accord Hybrid has a premium entertainment package that will keep your passengers entertained with superb enjoyment. The perfect balance of speed and control has been injected into this 2017HondaAccord Hybrid. This wonderfully appointed vehicle comes equipped with the options and features every driver craves. If, upon choosing the road less traveled you find yourself lost, relax and remember this beautiful car has navigation. This Honda Accord Hybrid comes with new tires for an improved ride, better fuel economy and quieter drive. The paint on this Honda Accord Hybrid Touring is flawless; no scratches, no blemishes, no need to spend extra money on touch ups. This is your chance to own the very rare Honda Accord Hybrid. 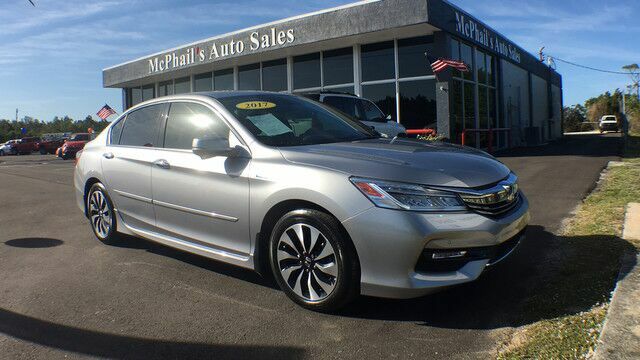 This Honda Accord Hybrid Touring has high-end wheels to enhance your ride and the overall appearance of this vehicle. he Honda Accord is very popular in the mid-size segment, continually selling at the top of a very competitive class.The Accord is a solid value, even in its humblest configuration. With its capable and sophisticated chassis, the Accord can feel quite luxurious when properly optioned. This versatility allows it to be either a spacious alternative to many economy cars or a less expensive alternative to many luxury cars. There is even a stylish coupe available with performance to match its already stellar platform.